The Increasing Pain of Going to Church: It's Just Getting Too Embarrassing! Boy, I've about had it with going to church here in Shanghai, China. Not sure if I can endure much more of this. Almost every sacrament meeting here with the Shanghai Branch so far, today especially, has been a zinger that brought unwanted embarrassing tears to my dry, manly eyes. I'm not sure if I and my male ego can stand much more of this. I was wondering if it was just me and then I heard the Branch President today also talk about what an am amazing branch we have here with such powerful talks and such a strong spirit in the meetings. It's been the most puzzling thing, though. I've wondered if it's the foreign setting, the increased sense of reliance on the Lord that being a stranger in China brings, or if it's something unusual about the mix of people we have here. Our Branch President did point out that the people giving talks in our branch take it seriously and prepare thoroughly. Perhaps the unusual setting we are in and the diverse personal circumstances of people in our branch might inspire them on the average to put a lot into their preparation. I don't think that explains it all. I've also noticed that I pay attention more, and I was intrigued to hear our Branch President say the same thing about his experience with the branch and its meetings. I've tried to be distracted and not pay very much attention, as normal, but I keep getting hit with thoughts from these talks and suddenly I'm hooked and can't let go. By listening and pondering as the talks are given, I think that allows the Spirit to touch me in new ways and remind me of more, teach me more, humble me more--I just wish the Spirit would do it without bothering my eyes. Today started off with a talk from a 16-year-old girl who has been largely raised in Shanghai with roots in Singapore (as I recall). In spite of being raised in Asia, the thoughts she shared about life, faith, God, sacrifice, and early morning seminary sounded exactly like the views I've heard from the most exemplary and faithful Latter-day Saint youth in Wisconsin, Utah, and Georgia. Actually, a little more so. I mean she was amazing, speaking with wisdom and maturity far beyond what I'm used to from teenagers, sounding a little more like a returned missionary. She shared the faith that it had taken for her to get up early to attend early morning seminary, in spite of the very high demands of education in Asia (American kids have it easy, I think). She shared the blessings that she has seen in showing her faith in God and the progress and joy that comes from listening to the Spirit and keeping the commandments. There wasn't an adult in the room who couldn't learn something from this marvelous young lady. And that was just the first talk of 3 powerful and beautiful ones. I'll be back in the US for a couple of weeks soon and hopefully I can recuperate and somehow brace myself for exposure to more of the intense spirit present in the Shanghai Branch. Not that it isn't great in Wisconsin--for some reason, it's easier for me to shield myself there and miss out on what is being offered. We'll see what happens. Have you run into people who automatically discount you just because of your faith? Mitt Romney seems to get some of that and other Latter-day Saints experience it in various forms. Mormons may gripe about it, but the "Mormon Discount" is not necessarily a bad thing. In fact, I was grateful for it here in Shanghai a couple of weeks ago. My wife and I were marveling at the buildings and the crowds at Shanghai's beautiful Yu Yuan Gardens, one of my favorite areas and just a short walk from my apartment. We were approached by a Chinese man who spoke fluent English and pointed out a few of the sites to us. I answered back with a little Chinese, leading to the question of where I studied it. I blamed it on BYU. "BYU? Sure, I know BYU. My brother went there. He became a Mormon and now lives in Spanish Fork. You must be Mormon." While avoiding any religious discussion, I admitted that he had made a correct conclusion. "That's great. I love Mormons and always give them a special discount in my shop." Our new friend was a pearl dealer, a special breed of businessman here in Shanghai. He kindly took us to his shop, a really beautiful place at Yu Yuan, and had his staff demonstrate how the extract cultured pearls from oysters. A large oyster was removed from a fish tank and it soon gave it's all for our benefit. He explained that of the roughly 20 pearls in that oyster, on the average maybe one would be good enough for jewelry and the others would be ground up as an ingredient for cosmetics. I hadn't seen this before and found it interesting. Then he kindly allowed us to look at his pearls all of which would get "the Mormon Discount"--80% off the marked price. I figured that would probably bring the prices down to the going street price and later searching suggested that was about right. We bought a couple strands for some people back home, grateful for what may be the most exotic discount available in China, the Mormon Discount. My gratitude became even greater after that. Now that we had made a purchase, he returned a very kind favor. There was a famous dumpling house he had pointed out to us as were walking around the area before being led into the pearl shop. There was a long line extending for many yards outside of the shop, with a wait of well over an hour just to get in. He said, "Would you like to try lunch there? Come with me. I'm friends with the owner." He walked past the long line and straight into the restaurant, where he took us back by the kitchen to watch the dumpling manufacturing process, and then he took us into what I think was a VIP room with some open tables. He got us seated and we were ordering and eating a few minutes later. If you were in the line waiting, I apologize. I was actually uncomfortable with exploiting the power of guanxi to get served before all those patient people who had been waiting so long, but I also didn't want to insult our friend who was giving us the Mormon Discount not only for the price of pearls but for the length of time required to dine at a famous place. I bit my tongue and accepted the gift. Sorry if it was at your expense, making you another victim of the Mormon Discount. Pioneer Day Update: Recalling the Sweetwater Crossing and the Bravery of Three Young Men - Or Was that Four, Five, or Fifteen? On Pioneer Day, many LDS congregations may be reminded of great LDS pioneer stories like the touching deep-winter crossing of the Sweetwater River in which three brave 18-year-olds risked their lives to carry the desperate group across the river. It's an inspiring story, but several important details may be wrong and this could be a good time to update our history so we can tell the story more accurately and give broader credit to the many people who sacrificed to help the Martin Handcart company survive. Toward that end, please read the thoughtful and carefully researched article by Char Orton in BYU Studies, "The Martin Handcart Company at the Sweetwater: Another Look" (BYU Studies, vol. 5, no. 3, 2006). The story we have heard frequently comes from one person's account, but now we have access to many other accounts to help us piece together what happened. There may have been quite a few more than three people in the water helping with the crossing. None were exactly 18, and it's not clear than any of them clearly died early because of that exposure, though it's possible for some. It's also unlikely that President Brigham Young said that anybody would get eternal life for one act of heroism--the concept of enduring to the end in accepting Christ still prevails as far as I can tell. The apparent errors are interesting lessons in their own right as Chad Orton traces them down and seeks to understand what people knew and meant. Wonderful historical investigation work, and a great way for us to refine our appreciation of the Pioneers on this Pioneer Day. For those who haven't read the article and continue to rely on what has been most commonly published and told, let's be patient! No snickering today when the old version of the story is retold. We are all humans and have limited access to information. It takes time for understanding to spread and to become updated. The possible errors in a popular account are par for the course in a world of humans keeping records and recalling and retelling what they've heard. Nothing to fall to pieces over. And if you're looking for reasons to be offended, this little issue is just not worth the trouble. There are better and bigger stones of offense to stumble over, and there are plenty of maps on the Internet to take you to them. In my last post, the first commenter bristled at the idea of the LDS Church using marketing. The response is natural and common, but based on misunderstanding, IMHO. Nothing personal, but I instinctively dislike the idea of a church, any church, engaging in marketing. Jesus is not a brand. Marketing has negative connotations for some people because of its monetary associations, but marketing is much broader than commercials to make a buck. Marketing is about sharing information, influencing others, changing behavior, changing the way people think, and getting the word out. When it comes to the Gospel, marketing, like gravity, isn't just a good idea: it's the law. In other words, Christians are commanded to share the Gospel and influence others to get the word out. Christianity is a brand in a broad sense, we are a brand, and it's our duty to represent the brand well and share it with others. Not for filthy lucre, but to glorify God and bless the lives of others. Be thou an example of the believers. So actually, we're supposed to be marketers, or rather, fishers of men, using our examples, our preaching, and other means to spread the Gospel to the whole world. In this era, that means not just mass production of literature, but mass media, social media, and other tools. The tools are there, the means are there to reach much of the world where it can be shared. We'd be more than merely foolish not to use such tools: we'd be negligent and perhaps even disobedient. Human life is all about marketing, one way or another. It's easy to fall for hostile stereotypes when you don't know the actual people in this religion. Many people in the world don't have any close LDS friends and many don't even realize that they know any Mormons. Learning a little about real people on the Church's websites can help. We need to be more visible and more present in this world. Here in China, though, it's a bit tricky. We are not allowed to promote our religion among Chinese citizens and to maintain the kind privilege of being allowed to meet and worship, we must be exceedingly careful about what we do. Even innocent questions people may ask us need to be gently deflected and the topic changed so that we do not run afoul of the law in letter and spirit. It's such a dramatic change. Before coming here, not talking about my religion was a sign of spiritual trouble. Now silence is an act of faith and obedience. I hope one day the rules will change, but for now, it's interesting to see how strict the Church is here in China in complying with the law, even being cautious to lock up hymnbooks when we are done since they are religious literature that we are not allowed to distribute. While the conversation may not be very lively over here in China, I do think there is an increasing global conversation about religion and about the LDS faith, and I'm glad to see it picking in places like New York City and beyond. I hope more people will look into Mormon.org and more of you will become part of that conversation. If you want to avoid buying a fake watch in China, learn a lesson from me and don't shop for watches when it's too dark to see what you're buying. Also, don't buy watches when it's bright--at least not if you don't know what you're doing. China has made serious advances in honoring and enforcing intellectual property rights, including the shutting down of hundreds of counterfeiting operations and many successful lawsuits for companies enforcing patent and trademark rights. I've met the founder of the Chinese IP system. Dr. Gao Lulin, and am impressed with what China has achieved. It's their increasing focus on IP that has brought me to this fabulous nation. In spite of all the progress, though, there are still some issues, like a thriving fake watch business. When I walk down any of Shanghai's hot tourist streets, I'll be accosted by those psychic Chinese peddlers who can somehow sense that I'm an American. "Buy a watch? Cheap! Cheap!" My response has been to point to my $20 Timex digital masterpiece, complete with an authentic black plastic wrist band, and say (in English or bad Chinese, depending on the situation), "Isn't this a beauty? Don't you think this is good? Why do I need another?" They'll say it's a good (politeness often prevails over honesty), but then kindly remind me that I can get a really good one from them, cheap, cheap! I've resisted the temptation. Recently, however, I've sensed that my obviously cheap watch is inadequate, in spite of its awesome utility (built in alarm clock that many very expensive brands don't have, not being digital toys). In meetings of all kinds, nice looking watches really seem to be the norm and I've begun feeling that it's time to upgrade my $20 cheapie to something more in the $50 range, if only to not look too out of place. Everyone else has a nice metal band, so I need one too, right? Hmm, see how the lure of the world works here? Can you jump ahead and guess how I lost my soul? So on my to-do list has been finding a nicer looking watch, cheap but not fake. I went watch shopping a few times in the US before coming to China and couldn't find anything I liked. Haven't had much time for that here (not with all my big adventures like making friends with harmonica players at parks or eating French crepes in the French Concession). But after work recently, I had the bright idea of stopping in at the nearby Dongtai Antique Bazaar, a really fun place close to where I live that I enjoyed when I interviewed here back in May. A good place to practice Chinese and hones one's skills in haggling over prices. With all those antique and used goods, surely I could find an old used watch that looked OK. Then maybe I could get something that was real, in the $50 price range, with basic functionality. I'd keep my digital Timex for its alarm clock function when needed on some mornings, but during the day I could wear something with a metal band instead of plastic. Nice intentions, anyway. It was dark and most booths were closed when I got there, but one with a few watches and lots of other stuff was still opened, just in the process of closing. I looked over the watches, barely able to see what the man had, but saw a nice looking face with a steel band and asked about the price. 1200 RMB. (About $190.) But for me, he was asking for less. Following the typical Chinese ritual, he typed in a new price onto the standard big LED desk calculator that all vendors seem to use and showed the price to me: 1000. Ouch, way over my budget, sorry. Well, hold one, don't give up, said the man, maybe I can give you a better discount. How about this? He typed in the digits and then showed me the new price 800. I apologized and said I really couldn't afford it and started to back away, waving my hands in apology. No, don't go. Just tell me, how can you afford. No, it's embarrassing to even tell you because it would be so insulting. I'm way out of my price range here and can't afford your nice watches. Well, what is your price range? Well, I'm so embarrassed, but it's just 300 RMB. What? 300 RMB, for such a terrific watch? I know, I know, I apologized, I feel terrible, but then you also have to realize that I don't know if this old watch will even work tomorrow, so that's why I have to be careful and not spend too much. Then I got a lecture on how he stood behind his watches and guaranteed everything, how he had been in business at this stall for years and wouldn't let his reputation be tarnished, etc. OK, that's good to know, thank you. But I really can't afford your price. Well, how about 400, he said? Mmmmm, 350? Deal. And I went home with my new random brand used watch for about $50. Nice band. Price negotiated well. Was feeling rather proud of myself. And definitely, not a fake, right, since it was just some random used watch, right? When I got home and looked at it in the light, my heart sank. It was an Omega. Omega--that's one of the old stalwart luxury brands from Switzerland. I remember so well standing in front of the Omega watch displays in Zurich, Switzerland in my first area on my mission and marveling at how much money people were spending on something as minor as a watch. Omega was one of the best ways to spend a lot of money. For a real watch, that is. The fakes are a lot less. Maybe it's real but old and I just got lucky? I set the time and looked over the watch--it seemed to be OK. The next morning it was already off by 2 hours. A fake watch without the decency to even keep time reasonably well. Sigh. I'll take it back soon and see if I can exchange it for something that isn't obviously fake. But a new friend of mine who works in the Bazaar now tells me that all the watches sold there are probably fake. Another soul snagged by the lures of the world. Maybe I'll just go watchless for a while? It seems like there is magic everyday on my adventure here in Shanghai, magic in the sense of blessings and even little miracles that make me more grateful than ever for the Lord's frequent kindness and help. This day began with a Skype call to my wife who is momentarily back in the States helping a couple sons with preparations for a wedding and a mission (two different sons--would be a bit awkward if both events were for the same young man) before we both become settled. Plans relating to an important aspect of our adventure became complicated with some bad news from people in the States, and we were struggling with what to do. We decided we needed to turn to the Lord for guidance, and decided to have a prayer together as a couple using Skype. I'm not used to using Skype for prayer, but it was fine. (Sorry, I can't give your the Direct Access number I called--you'll have to ask President Monson for that.) Within 20 seconds after I said "Amen," the phone rang. It was an LDS couple calling about the topic of our concern, offering a possible solution. We'll see, but it seemed so kind. As I prepared for the day, I packed a backpack with some items such as my journal, some Chinese language materials to study, a notepad, etc., and planned to go hang out in Shanghai's famous Zhongshan Park after church to see the area and be productive. Well, as usual, I never go to any of the big things on my list, but the decision to go to Zhongshan Park turned out so well--what a blessing that was. After a great day at church (hurray-I understood more of the Chinese language Sunday School and Elders Quorum meetings I attended and really enjoyed the lessons today), I started walking back to the subway. Some of the younger members of the ward were in a group in front of me. I heard them mention Zhongshan Park. Hey, that's where I'm going. Mind if I follow? I hadn't checked the map to determine which subway stop was best, though I'd been near it before and knew it was on Line 2. Turns out the right stop is conveniently called Zhongshan Park, so it's hard to miss. But because of the decision to go to Zhongshan Park, I ended up hanging out with a great group of LDS people, about 15 of them, and got invited to come over to a brother's home with the group for dinner. I spent about 3 hours with this group and enjoyed their company immensely. The Shanghai Branch has such amazing people from so many walks of life, some here for years and other just visiting. From IBM executives to mixed martial arts cage fighters (our awesome Gospel Doctrine teacher, one of the coolest people ever with numerous talents, really loved by other members of the ward), we've got it all. Today alone I chatted with people from the Ivory Coast, France, Singapore, the Philippines, Australia, Britain, Taiwan, Germany, Hong Kong and more. What a ward! Dinner was simple but so delicious. Good pasta, great spaghetti sauce loaded with fresh garlic, good bread, Parmesan cheese--even with all the wonders of Chinese cuisine, sometimes the great comfort foods of the West are hard to beat. The conversation was so lively. I'm really impressed with the young people I talked with. One was a new couple who just flew in the night before, a couple that had both served in Taiwan as missionaries and knew my Taiwanese missionary son from the MTC, where the wife was his teacher. Another young person I chatted with was a bright mind who has been exploring LDS history and other LDS issues in depth, in addition to Chinese and his main field of study. Very refreshing to talk to him. Others were sharing important thoughts and knowledge on issues of culture, history, science, travel, etc. So many bright, promising people, so kind and warm. They and the rising generation of Chinese people I am coming to know give me hope for the future. After a joyous afternoon with that group of members, I went into Zhongshang Park as planned, thinking I'd find spot to site and write or study--after, of course, wandering and taking photos. There was uplifting music playing as I entered the crowded park. I scanned the faces of the people I am coming to love and respect and just felt so touched to be there with them, so proud of the good that I see in them and so honored to be here with them in their beautiful land of infinite potential. I heard some great drumming and went over to watch--I think it was an impromptu gathering of people just getting together to drum. How nicely it turned out. Then I went a little further and marveled at the kite masters who were controlling large kites several hundred yards above the park. The art of kite flying is so advanced in China. The masters have special large reels and lots skill, and amaze me with the ability to have a high density of kites flying without collisions and tangled lines. Then I turned a corner and had one of those magical moments that make a day unforgettable. A small crowd was gathered around an older man who was playing a harmonica with an electronic sound pickup to amplify his music. Wow, this was a master of the harmonica. One thing I recall from my first visit to China in 1987 is that one easy way of respecting and even helping the local people is to show appreciation and interest in their performances. I remember that by stopping to admire a child street performer as he did magic tricks in Chongqing, his tiny audience became huge by virtue of the seal of approval that my in interest somehow gave. Then giving him a nice tip helped motivate others to contribute, as I recall. Would the same thing play out here? Not quite, but the results were even better. As the musician played with harmonica with great expressiveness, I snapped a couple photos but then, out of respect, put the camera down and just admired the music. I clapped and shouted out a few words of praise in Chinese. To my surprise, I soon became the focus of a rapidly gathering group. The man said he would dedicate his next song to me. Like many Chinese, he had this almost psychic ability to just look at me and somehow know that I am an American. Then he began playing a version of "Jingle Bells," the famous Christmas song. Then he played the song "Do-Re-Mi" from the Sound of Music, and then Auld Lang Syne. It was awesome. I then pondered what to do next, not wanting to embarrass him or cause any problem, but anxious to be helpful in some way. I looked for an open case, hat, bucket, or something where people could toss money. 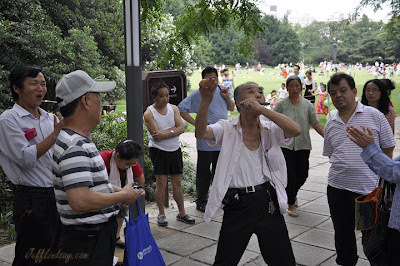 Unlike a previous street performer at the park, there was none of that. So when he appeared to have wrapped up, I walked over and discreetly tried to give him what I described as just a small gift to say thanks. Ooops, wrong thing! No, no, no, he insisted. This suddenly created a lot of interest and the crowd moved in close to catch the action. I explained more fully that I had been so touched by his music and was just trying to say thanks. Others chimed in and explained that more eloquently, but he responded with a big smile that if his music had made me happy, that was all the return he needed. What a classy guy. With my bad Chinese, I said that good people like him were one of the reasons that I think China is such a great nation. That went over really well - some applause and vocal approval. I then pulled out a notebook and asked him to write his name. A friend of his asked for mine and I gave him my business card, and soon a lot of people were asking for my business card, and there was discussion about my work and where I'm from. Salt Lake City originally, and they had heard of it and Utah. And then his friend brought up John Huntsman, a pretty famous name over here. Cool! 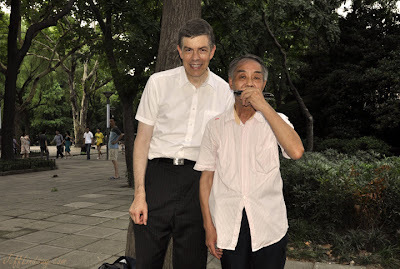 One of the people kindly took a photograph of me and the master of the harmonica, Mr. Li, a wizard of Zhongshan Park who helped me have one of my most magical Sunday afternoons ever. When it was time to part, I was shaking hands and saying good-bye to many people and felt like I have new friends I can look forward to meeting again. 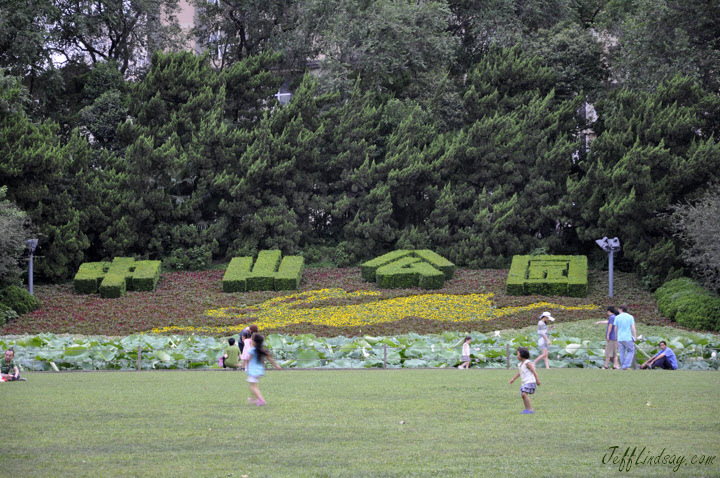 I think I'll be back to Zhongshan Park, a magical place. I definitely need to get back, for I never even got started on all the writing and study I need to do there (or somewhere). The shrubs here spell "Zhong Shank Gong Yuan" = Zhongshan Park. I expected to face a lot of bias when I came to China. Being an American at a time when America can easily be viewed as a warlike aggressor, I came here prepared to face a little bias. I came here expecting the warmth and kindness that I experienced when here briefly in 1987 to be somewhat cooled. To my surprise, it's as fervent as ever. I am the subject of bias day after day, but it's the kind of bias I enjoy facing. It's unfair, I know, but for some reason people are inclined to treat me better than I deserve to be treated--or perhaps with the kindness that every stranger should receive in this world. Today at lunch, a friend from another Asian nation was telling me that in his opinion, Americans and Europeans seem to get treated with unusual politeness over here and he couldn't figure out why. I was surprised and hadn't really noticed the discrepancy (just not paying attention). Immediately after explaining this, we got up to leave and the restaurant staff all started smiling and nodding at me. Some who were sitting eating their own meal stood up to bid me farewell and waived goodbye. They made me feel like family. He shook his head. "They never look at me that way here," he said. "It's even worse than I thought." To be fair, I had been to that restaurant twice before and had shown appreciation for their kindness--but the kindness began on day one. I got there for a late lunch after they had shut down. They could have been bureaucratic and sent me away hungry, but they explained the situation and said I could eat what was left, which I gladly did. I left a hefty tip, too--something you're not supposed to do and something that doesn't always get accepted, but they at least got the message that I appreciated their flexibility. I think being almost 2 meters tall helps. I'm a curiosity, one that speaks bad Chinese but at least tries, and many Chinese locals really seem to appreciate that. The restaurant, by they way, is one of the best places for a good, inexpensive lunch on the Bund. It's called Manko and is hidden away on the second floor of the Golden Financial Tower on Yan'An Street right between the main drag on the Puxi side of the Bund and the Waldord Astoria. Financial business people eat there so I expect food safety to be high and I've felt great after all my meals there. What amazes me is that for 18 RMB, about $2.60, they bring you 7 to 8 different items and they are all good. You can't do better than that even risking crazy little places on the street. Back to the problem of bias. We humans are loaded with bias in how we approach others. Sometimes bias reflects sound experience and helps us summarize large stores of information effectively, but other times it is wildly incorrect. It's something we need to be open to when we confront new people. Consider your attitudes and biases when you confront a beggar, for example, and ponder how that reflects on who you are. That's part of the profound message of King Benjamin in his ancient discourse that still amazes me with its wisdom and literary power. Do the same when dealing with someone of a different faith, even a faith you consider weird like, oh, the Mormons, if you're not one (and perhaps a fortiori if you are). Sometimes our biases blind us to the truth or to opportunities to connect and love someone that could be a friend. If you're reading this here in Shanghai, maybe your biases are making you treat me too kindly--but don't fear, I'm willing to accept that. No hard feelings! OK, one more example. Tonight my Big Dreaded Language Adventure was returning the yinshuiji (the water machine) that wasn't quite working right from day one when my wife bought it. I've never used these before except to get a drink or two in someone else's office, and didn't dare try to remove the big blue water tank until it was empty. That took a couple weeks. I think their policy is returns have to happen within one week. I wasn't concerned because I could dispense water from it, but the hot water feature didn't work and my wife wanted me to return it. Well, OK, I'll eventually give it a try, I said to myself, but I expected failure. And I also expected language failure because service people in busy stores usually don't speak English and aren't all that great at speaking slowly. So tonight I had the empty cylinder and was ready for the dread task. There was a big line at customer service and things were popping busy at my local E-Mart. But the customer service lady understood the issue, asked a few questions that I pretended to answer (simple enough that I think I understood her--hurray! ), and then bingo, she took me over into the store and gave me a new yinshuiji. She also kindly told me that next time I had trouble, I needed to [unintelligible], to which I nodded my head knowingly. So here I am with a fully functional water machine. Life is sweet, just like that busy customer service woman. I know she could easily have been too busy and used the official rules to turn me away. Was I the victim of undeserved bias? Yeah, I think I was. At least for tall Americans, this is such an awesome country. Tallness does come with a price, though. If you go to Manko's, duck. Duck a lot. There are several places where the ceiling is only maybe 5 feet 8 inches tall. My second time there I got a nice bruise entering. But I smiled and told them it was nothing. When it comes to international relations, sometimes you take it on the chin, but most of the time it's the forehead. One of the things I've loved about my journey in Shanghai is all the great people I've met. Really great people. Some of the world's kindest, most honest, and most noble people are Asians. Yes, there are people who are willing to take advantage of you, but I see them as the sad exception here. I feel like I'm far more likely to encounter honesty and kindness with the people here. Rose-colored glasses? Or red-colored? I really don't think so. As an example, at least three times we have left money behind or dropped money only to have people scurry after us to return it or carefully return it. And our real estate agents, two English-speaking Chinese men who did a great job in finding the ideal apartment for us and showed a lot of patience and kindness with us and then negotiated almost 20% off the asking price, utterly refused to take the non-negligible cash tip we wanted to give them after the deal was closed. (If you're looking for an apartment in Shanghai, I really recommend Max and David at www.orientalrealestate.net. I think it's Max's company.) And people at work don't have to be as careful to protect computers and private property as I'm used to in the United States. Theft seems to be much less frequent here than it is in many parts of the world, though I'll always advise travelers to be cautious. One "honorary Asian" in the noble and kind category is a woman I read about earlier this year before I even knew about the dream job that brought me here. The woman is Amanda de Lange, founder of the Throwing Starfish orphanage. I got to meet her today in the Shanghai Branch. What a treat that was. OK, this honorary Asian is actually African, having been born in Africa, but is now largely Chinese, at least in heart, and speaks the language very well. A few years ago she had an opportunity to take a high paying job in Korea, but at the same time the government of China asked if she could take on a foster home in Xian to help kids from orphan homes. I hope I've got that part of the story right--correct me if you know the details better. This single LDS woman and BYU grad felt that the Lord wanted her in China serving the children here, and so she accepted the opportunity and founded a foster home to help special needs children. It's called Throwing Starfish, a reference to the story of a boy who was throwing stranded starfish on the beach back into the ocean to save them. A skeptical man explained that this was ridiculous, for there were hundreds of miles of beach and tens of thousands of starfish on it, and so he couldn't possibly make a difference. The boy picked up another starfish, threw it back into the ocean, and said, "I made a difference for that one." Amanda is making a difference for hundreds--but she needs help. Medical assistance, donations, time, etc. Here is some information about this project. Deseret News story: "BYU grad saving Chinese children, one starfish at a time"
Thank goodness for people like Amanda! Why not get involved and help her out, too? I'm also grateful for the officials who recognized the need and allowed a great LDS woman to step in and help meet the needs of Chinese children. These small kindnesses from officials, including the kindness that allows Latter-day Saints from other nations to meet and worship in Shanghai, are not trivial things. Somebody, some official, had to go the extra mile or even take on personal risk to give that help. Much appreciated! There are miracles on every street corner here in China. At least that's the only way I can figure out how 200 people can cross a street in the 20 seconds of a green pedestrian light while a similar number of taxis, scooters, motorcycles, bicycles, and motorized rickshaws plow through the pedestrians at the same time, all without any serious physical injuries apart from a little hearing loss due to the requirement to honk constantly. Traffic laws are a little different here, a little too complex for most Americans to figure out. For pedestrians, a red crossing light means "don't even think about crossing now - that would be crazy." Vehicles of all kinds race through the intersection, making sure they honk appropriately at one another apparently conveying messages of encouragement such as (I'm guessing) "May we all strive for social harmony!" Crossing at this time would be shear madness. When the crossing light turns green, that means "go ahead and think about crossing, but it's still crazy." For drivers, I think the difference between red and green in these cases involves some nuance from the languages of China--it's all about the tones. Maybe when the light is green you honk with a rising tone, and when it's red, you use a dipping tone? Or a falling tone followed by a dipping tone? It's all a bit too much for me, but it makes life at every corner an adventure, and I love it. I've realized that for all these years, I've been a city slicker trapped in a small town guy's body. There is slight exaggeration in my description and it's really not that bad, as long as you realize that vehicles are still allowed to make right turns, sometimes at high speed, at the same time you see the green crossing signal. And sometimes, drivers apparently confuse "right" with other directions, so always watch your step. But it's fine as long as you look both ways and pay lots of attention. Based on the miraculous survival of nearly every pedestrian and driver I've seen so far, it all works out somehow. But it's clearly best if you have a few ninja-like moves to get out of the way of the most dangerous vehicle of all: the environmentally friendly scooter. The problem with being environmentally friendly and electric is that these surprisingly swift vehicles lack the put-put or vrooom-vrooom sound of old-fashioned environmentally deprecated combustion engines vehicles like the Harley-Davidson motorcycle. For years I was annoyed by the noise of motorcycles; now I yearn for it. The noise gives you a fighting chance to get out of the way when they come up from behind. Here, you rely on the mercy of the driver. Will they honk? And if so, will it be in a rising or falling tone? I should mention that an important part of the traffic rules here is the distinction between roads and sidewalks. Motorized vehicles and bicycles are strictly limited to staying on the roads, unless it's more convenient to use the sidewalk. Pedestrians, take note and be on your guard at all times. It's more challenging than a stroll in Appleton, but again, I love this city. It is beautiful, inspiring, challenging, frightening, depressing, enlivening, wild, ferocious, gentle, and a perfect place for Americans trying to get a gentle taste of China, or to be overwhelmed suddenly with the rush of the world's largest city proper. The people here are great and the city is just remarkable in so many ways. But the chaos at intersections is a reminder that, in spite of Shanghai priding itself on being an advanced and highly civilized place, in some ways it is still a lot like New York City. So watch your step, but come visit Shanghai and enjoy one of the greatest places on earth. I've been so lucky and blessed here. The other night, for example, I was giving an American visitor a tour of a beautiful part of Shanghai, Yu Yuan Gardens, when I put my camera up to my eye and somehow managed to knock out my contact lens. We were on a busy street as it was becoming dark and my contact had fallen to the ground. Life would go on without it, but it's something that really helps. I froze, explained what had just happened, looked all over my shirt, arms, and pants in hope that it had landed there, and realized it must be on the ground. Vehicles, people all around, time is limited, what to do? He told me to stand still while he carefully stopped down. Fortunately, he had an iPhone with a light. He turned it on and saw something glisten, finding my lens before it was trampled. Another close call. Small mistakes over here can be quite costly. Help in averting them is so greatly appreciated, and the little answers to silent or vocal prayer that I've received on many occasions like that one are much appreciated, in spite of the mistakes I make that aren't so painlessly resolved, like groggily slicing into my finger with a knife as a result of staying up too late when I knew better, trying too hard to get extra things done and just making everything worse. Be sure to bring Neosporin in your international trips, by the way. Anyway, here are some photos, some of the hundreds I've managed to snap while here. Yes, I am actually working and working quite hard, in fact. Love China and Shanghai especially. There is so much future here. And a lot of present and past as well. Update, same day: My first big night of doing laundry by myself. Found a relevant blog post: "The Notorious Chinese Washing Machine Story." I think my 2011 washing machine is even more advanced than the 2007 version in that post. If I'm translating correctly, mine also includes programmable functions for "complimentary charring," "fabric disintegration," "instant electrocution," and "unfavorable meltdown." I know just enough to recognize nearly all of the characters on the washing machine, but recognizing a character and understanding its use in a shorthand, specialized phrases are two different things. For example, beginning/intermediate students of Chinese will learn that 漂 (piao with a high tone) means to float or drift, but in the combination 漂亮 (piaoliang) the two characters together mean pretty and there the piao takes a falling tone. OK, I sort of learned that. But it's used several times on my washing machine and floating and beauty don't seem to fit. It's used in the phrase 漂白剂 (piao bai ji), which I now know means "bleach" (and piao takes a dipping tone there--this is a complex character!). "Floating white liquid stuff" - well, it's bleach. But then it's used a couple of times over the button that apparently indicates what treatment is being applied. So right now my clothes are going throw a cycle called "漂洗" - piao plus a character meaning "wash." So is this a bleach and wash cycle? Or a floating wash cycle? Pretty wash? None of those. My favorite online dictionary explains that this means "rinse." And there we use the dipping tone for our complex, always changing piao. Fortunately, the landlord, knowing that complete idiots might move into this apartment, has put helpful stickie notes all around the complex buttons and control panels that govern the various features of our high-tech apartment. The notes, of course, are in Chinese, but not in the style of legible, printed characters that I can sometimes read. I think she's using the classic Tang Dynasty "flowing grass in a tornado" style of calligraphy which adds a great deal of dramatic intensity and emotional purity to her messages. One does not need to read Chinese to be deeply touched by the power of her writing, and indeed, we are deeply touched. Hmmm, that smell - I think my shirts are charring as I write. Tip to Chinese teachers: Reading enough to be able use a washing machine, rice cooker, bathroom fan, TV remote control, and hot water heater are some of the best survival skills for people moving to China, but I don't think any of that was ever covered in the courses I've had or in textbooks I've seen. Not to complain--I'm the foreigner here trying to make do in a fabulous place. I just hope my clothes will survive the journey. Anyway, here are some photos for now. Click to enlarge slightly. The photos of small boats are from Wuzhen. The Buddhist temple scenes are from Suzhou. Skyline shots are Shanghai. Above is a fisherman who uses cormorants to fish. The jump into the water and swallow fish, but a ring around their throat tied to the boat keeps them from swallowing the fish, so the fisherman can retrieve it from them. Maybe they get the smaller fish or chopped bits, I'm not sure. But the birds seem to cooperate well. The building in the background with the "crown" is the Bund Center--that's where I work. The Bund is the riverfront area in the heart of Shanghai where you can see the most beautiful skyline in the world. We have older, beautiful building on my side, and exotic tall, LED-lit buildings on the other side. Cool stuff. Just love the views.